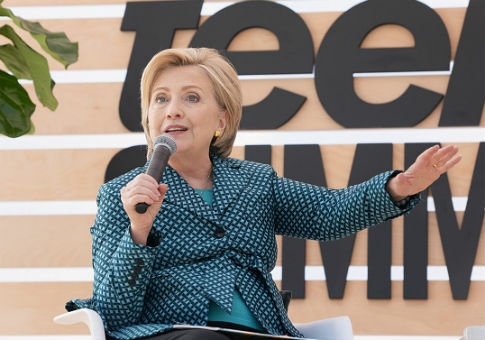 Former Democratic presidential candidate Hillary Clinton will present the 2018 Hillary Rodham Clinton awards to individuals who advance women's role in creating a more peaceful and secure world at a Georgetown University event next week. The former secretary of state will give her speech in Georgetown's Gaston Hall on Monday, and is expected to discuss "the importance of women's leadership in advancing human rights, justice, and peace," according to a school press release. Following Clinton's speech, she will present the Hillary Rodham Clinton awards, conferred annually by the Georgetown Institute for Women, Peace ,and Security, to two women who have overcome personal adversity in times of conflict. This year's awardees are Nadia Murad, a former ISIS captive, and Wai Wai Nu, a Rohingya activist and former political prisoner from Myanmar. Both women have overcome tremendous personal adversity and become powerful voices for women's rights in conflict. Murad is now a Yazidi human rights activist and United Nations' Goodwill Ambassador for the Dignity of Survivors of Human Trafficking. Nu works as a civil society advocate for human rights, democracy, and peace in Myanmar. A special Global Trailblazer Award will be presented by Clinton to BBC chief international correspondent Lyse Doucet for her courageous reporting on war and her efforts to spotlight the impact of conflict on women and children. Doucet will moderate a conversation among the participants at the awards ceremony. The event is open to the media and members of the university community. Clinton started the U.S. National Action Plan on Women, Peace, and Security at Georgetown six years ago and currently serves as the honorary founding chair of the institute. This entry was posted in Politics and tagged Georgetown, Hillary Clinton, Human Rights, ISIS, Women. Bookmark the permalink.